Sometimes, all it takes is a slightly different perspective to change the way you look at the world. As we walked onto the dock to toss our beach towels over a chair, we quickly found ourselves covered with spider webs. They were in our hair. Our eyes. Our mouths. And every other body part that came into contact with them. “That’s one thing about boat docks,” Connie said with a laugh, “spiders love them.” She picked up a long stick and cleared the way for us to descend the dock steps into the lake. Backstroking toward open water, I couldn’t help but notice several swallows soaring and dipping in and out of the shed that covered the boat. “I take it they nest there?” I asked. “Yep,” Connie said. “And they make an awful mess while they’re raising their babies. But we don’t really mind. In fact, we’re happy to have them.” Hmmm. I’d never a heard boat owner claim to like swallows. We reached our turnaround point and flipped over to do a breaststroke. As we got closer to the dock, I noticed that the posts holding up the shed looked like they were completely covered in fur. “What in the world?” I asked. Connie told me they were mayflies, millions of which had recently hatched in Watts Bar Lake. 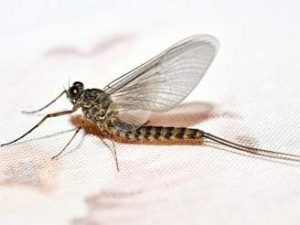 Mayfly nymphs spend most of their lives—sometimes up to two years–on the bottom of lakes and rivers. When they get their wings, they fly out of the water in a colossal cloud and molt one last time. Then they have only one thing on their minds—mating. Males swarm over the water and females fly into the swarm to be fertilized. Then they lay their eggs while hovering low over the water. Those eggs sink to the bottom. Soon afterwards, the adult mayflies die. Until then, they’re food for fish, swallows and other birds. They’re frequently caught in spider webs, which was why the dock posts looked furry. And they’re a challenge to humans forced to contend with them. In some places where mayflies swarm by the trillions, they’re considered a tourist attraction. Snow-moving equipment is often used to clear away their rotting carcasses. Here’s the really interesting thing. Mayflies are extra-sensitive to pollutants, so their presence in a body of water is believed to be a sign of a healthy ecosystem. A comfort to those who are just a little worried about swimming in Watts Bar Lake. And those, me for instance, who used to see swallows and spider webs as a nuisance instead of a blessing.